This package includes a special case, plus a cushioned carrying pouch. 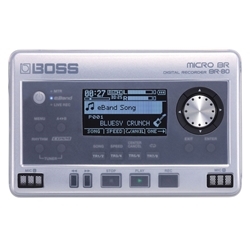 Made of a soft silicone rubber material, this specially designed case allows the BOSS MICRO BR BR-80 to be used while inside the protective covering. The case guards against dirt, scratches, and minor impacts, and keeps the recorder from slipping on smooth surfaces. This custom pouch is also cushion-lined to absorb impact.